The contents of the SIHR data base can truly be considered remarkable, and are a valuable part of hockey history. With statistics dating back to the 1886-87 season for various pro, semi-pro and amateur male and female leagues as well as notes and in some cases photos, the SIHR data base is unique. In addition to players, members have also started to add information on officials, coaches and executives. When SIHR was founded in 1991, three men with a passion for statistics were among those present. They were Ernie Fitzsimmons of Fredericton, New Brunswick, the late John Patton of Islington, Ontario, and the late Pat Conway of Syracuse, New York. John Paton worked for 40 years researching statistics of various North American leagues. He traveled extensively, including many trips to the Library of Congress in Washington and even to England. He also made many day trips to places such as Timmins, Ontario, for which there were no newspapers available on microfilm. Paton's work was reminiscent of that of Charles Coleman's, with more diligence for lesser known leagues. While this research offered a great starting point, a large amount of information was still needed, such as goaltender W-L-T, league standings, playoff results and more. His work was also limited to the timeframe from 1926 to 1960. Pat Conway also researched statistics, but his real interest was in obtaining player profile information. In order to gain as much vital information about former players as possible, Mr. Conway sought to obtain a telephone directory from each city in North America that at one time had organized hockey. He then wrote to any person who had the same surname as a player on a roster until he located former players in order to inquire about their place and date of birth, position and shooting direction, playing size and info on any other player they may have known. Data of this type on AHA, CHL and California League players alone would be virtually impossible to duplicate today. Ernie Fitzsimmons was primarily a collector of player and team photos before seriously jumping into statistics research in 1973. Using the library at the University of New Brunswick as his research facility, he poured over newspapers from most Atlantic Provinces from the 1900's forward in addition to publications from Quebec City, Montreal, Toronto's Globe and Mail, The Winnipeg Free Press, The Vancouver Sun, The Boston Christian Science Monitor, The NY Times, The Washington Post and various other small town papers obtained through inter-library loans. From there, Mr. Fitzsimmons was able to complete many leagues and start others. He has traveled to work on microfilms of papers in Quebec City, Montreal, Halifax, Sault Ste. Marie, Ottawa and Springfield, Mass. Among his accomplishments is that he completed much of the statistics of the 1900's-10's and 20's, which is a largely un-researched area. Years before the advent of computer spreadsheets and Internet data bases, Ernie set about creating a "Player Record" for each player on every team he researched. Using a cardboard index file, he manually jotted down the statistical and photograph information, which he then enhanced with information he exchanged with Pat Conway and John Patton. These cards would become the basis of the SIHR data base we enjoy today. In 2003, James Milks joined SIHR and inquired about enhancing the group's web presence, which at the time was a one page site limited to membership information. James worked with Ernie who had a vision of bringing his statistics to the group, and after hundreds of hours of development, the SIHR database was born. Dave Weigum of New Brunswick joined in 2004 and was responsible for giving the project a huge boost when he shared his data base with SIHR, which was imported directly into the SIHR data base and pushed it past the 10,000 player mark. What began modestly as a project to offer the records of all NHL players online, has blossomed into a data base of more that 100, 000 players from all corners of the globe. While the work of these three formed a solid base, contributions from many others greatly augmented the data base as well. Don Andrews of Pembroke. Ontario, did a lot of work in the 10's and 20's and is responsible for most Upper Ottawa Valley Senior and Junior stats throughout the years. Ed Sweeney researched Manitoba stats, Bob Duff also did some great work on early NHL-PCHA stats as well as 1920's and 30's obscure minor leagues. Charlie Roth has researched the WIHL. 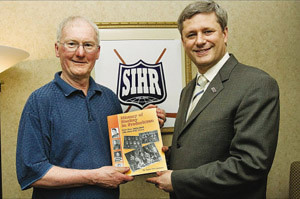 Dave Talbot has researched Saskatchewan hockey from the beginning, as has Don McEachern. Patrick Houda has provided many European ,World Championship and Olympic data. The work of those who diligently input data must not be overlooked. R.J. Pratt and Wilbrod Despres have jointly entered tens of thousand of rows of statistics. Others who have input and done research include Mike Starchock, Alex Laney, Wayne Geen, Martin Harris, Greg Inkpen, James Karkoski, Guy Latour, Seth Lerman, J.P. Martel, Greg Nesteroff, Joseph Nieforth, Al McAllum, John Purtell, Charlie Macdougall, Martin Schmid, Bob Visser, and Earl Zukerman. In 2012, XML Team graciously began providing daily NHL statistics. Thank you to all of those who have contributed. Together we will continue to make the data base even better. If you wish to help, please contact James Milks.